Hello Linux Geeksters. 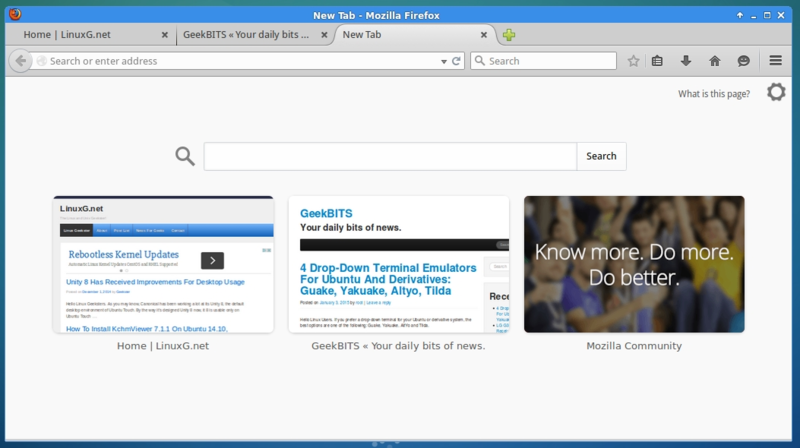 As you may know, Firefox 36 has been released yesterday, coming with support for HTTP/2, the native support for HTML5 YouTube playback feature has been added but it is disabled by default, brings a feature to synchronize the pinned tiles from the new tab page and the 1024-bit RSA keys have been phased out. Unfortunately, it does not come with GTK3+ Firefox UI support, but the Fedora developers are working at a GTK3+ version of Firefox. In this article I will show you how to install Firefox 36 on Ubuntu 14.10 Utopic Unicorn, Ubuntu 14.04 Trusty Tahr, Ubuntu 12.04 Precise Pangolin, Linux Mint 17.1 Rebecca, Linux Mint 17 Qiana, Linux Mint 13 Maya, Elementary OS 0.3 Freya, Elementary OS 0.2 Luna, Pinguy OS 14.04, Peppermint Five, Deepin 2014, LXLE 14.04, Linux Lite 2, Debian Jessie, Debian Wheezy, Fedora 21, Fedora 20, OpenSUSE 13.1, OpenSUSE 12.3, Mageia 4, OpenMandriva 2014, ROSA Desktop, Arch Linux and Manjaro systems. Because Firefox 36 is not available via any repository yet, we have to download Firefox 36 from the Mozilla site, extract the archive, move to /opt and alias the launcher. To start Firefox 36, just open a terminal, type firefox and hit enter. To start Firefox 36.0, just open a terminal, type firefox and hit enter. 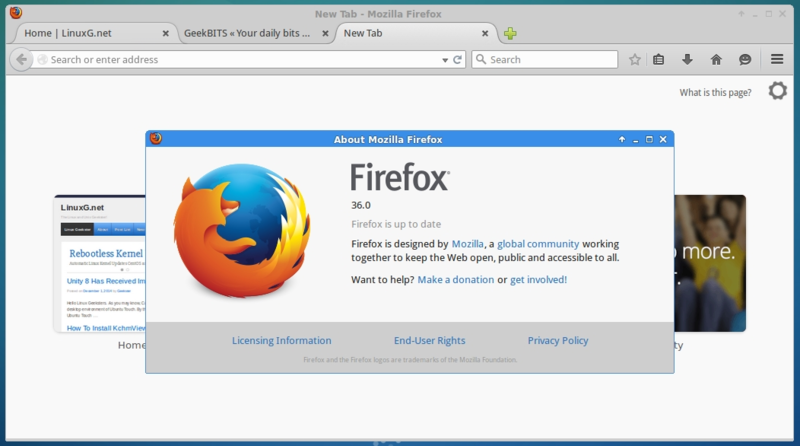 Note: This will replace the version of Firefox you have already on your system with Firefox 36.